South Africa: President Jacob Zuma; Minister Edna Molewa: STOP all HUNTING of Kruger National Park's BIG GAME! This petition has been created by CJ C. and may not represent the views of the Avaaz community. 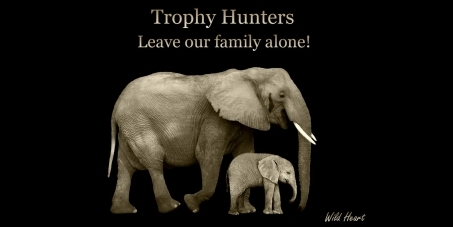 ELEPHANTS AND OTHER GAME OF THE KRUGER NATIONAL PARK IN DANGER FROM TROPHY HUNTERS!! A prominent trophy hunting broker is openly advertising “Hunt Elephants in South Africa” which the South African government allows. The problem with this is that the hunts are being conducted in the unfenced Associated Private Nature Reserves (APNR) where they border the KNP where all the fences were removed in 1993, allowing the animals of the Kruger to roam freely into the private reserves. So basically animals that roam from the KNP, and if you have their advertised price of $65,000, then the Elephants are subject to being killed by wealthy Trophy Hunters. When will this kind of irresponsible legal hunting stop? And why does the U.S.Fish & Wildlife Service not include all countries in the ban against the export in ivory? The short answer is that according to USF&W Service, "it is due to reports of rampant poaching in Tanzania’s Selous Reserve and the mass poisoning of elephants in Northern Zimbabwe's Hwange Park." So now all the hunters will come to South Africa and Namibia to do their killing. 1.4 Million tourists from all over the globe visit the Kruger National Park each year to see and photograph Africa’s beautiful animals under the impression that it is a protected reserve, free of Trophy Hunting. This is now very questionable and in my opinion could be extremely damaging to SanParks reputation and future tourism. Also this hunting web site is the one that has sold and is currently selling hunting packages to kill the rare Namibian Desert Elephants (which one of these was killed less than two weeks ago). The information in this article is taken from a public hunting web site and is in no way representing anything but the facts contained on their public domain. Article and photography by Wild Heart. Below is the web page (Discount Africa Hunts) advertising the hunt.